Halloween is the ideal DIY holiday. From picking and carving your pumpkins to decorating your home for Halloween, you can do it all yourself and have fun and stay on a budget. So when the day arrives, don’t settle for those orange plastic pumpkin buckets, make your own Halloween trick or treat basket and customize it any way you’d like. 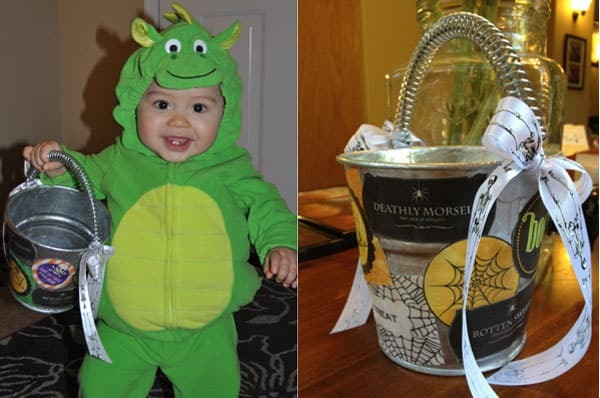 My sister Felicia shared this basket she made for her son Reagan who is one and celebrating his first Halloween. 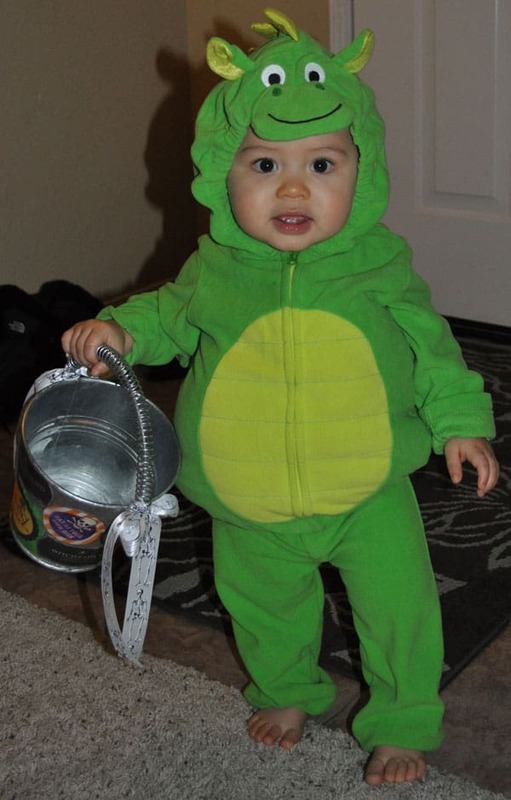 It only took her a couple hours the day before Halloween and it was ready for trick or treating the next day. Here’s how she did it and it all took less than $15 from her local hardware store. You can find free printables to use online. You can also cut out photos from magazines. 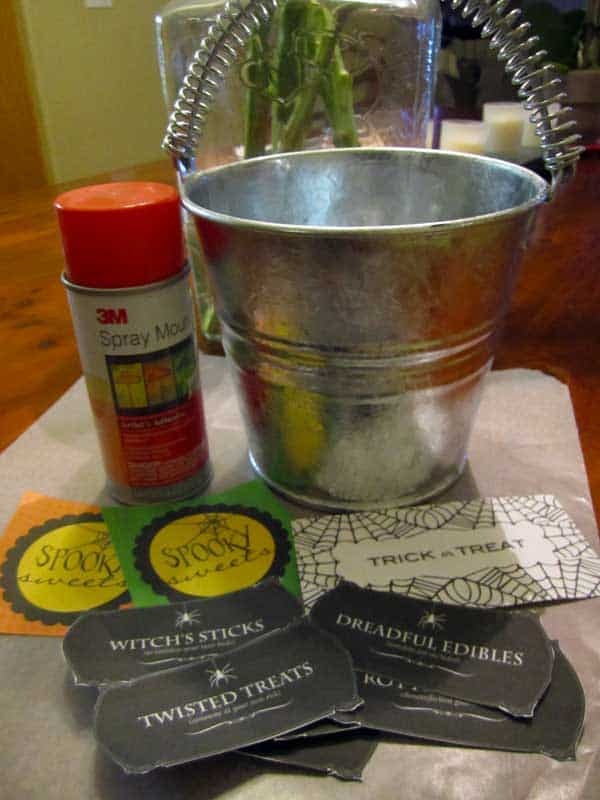 It’s fun to incorporate some of your kids interests into their bucket so if they are into trucks or spiders use those to decorate your bucket. 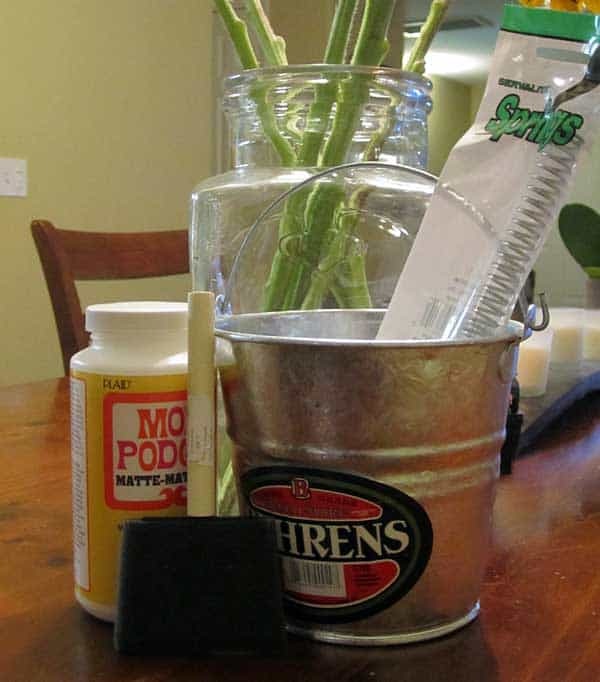 The bucket and spring we picked up at the hardware store and the Modpodge and ribbon we grabbed from Michaels using a 40% coupon which is available each week. Use pliers to pull the spring onto the handle. 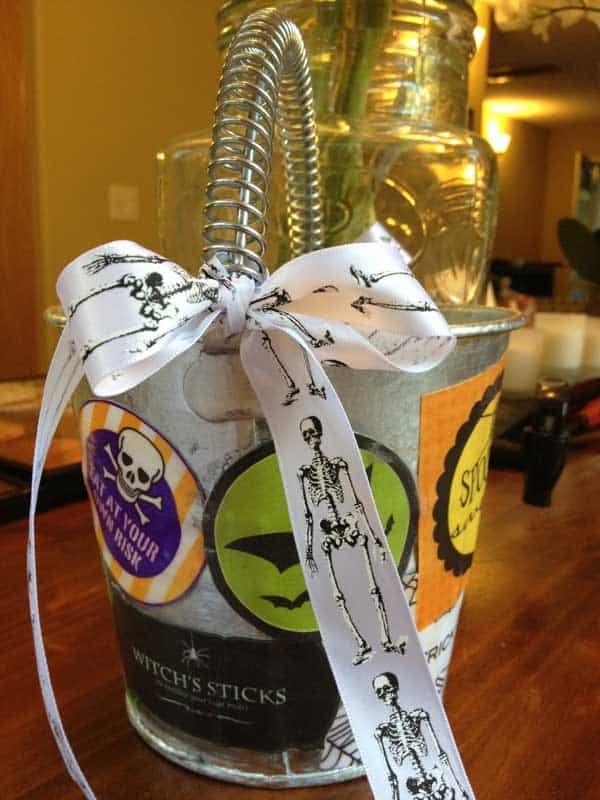 The spring over the handle makes it much more comfortable to carry the bucket, especially after it’s heavy with Halloween candy. 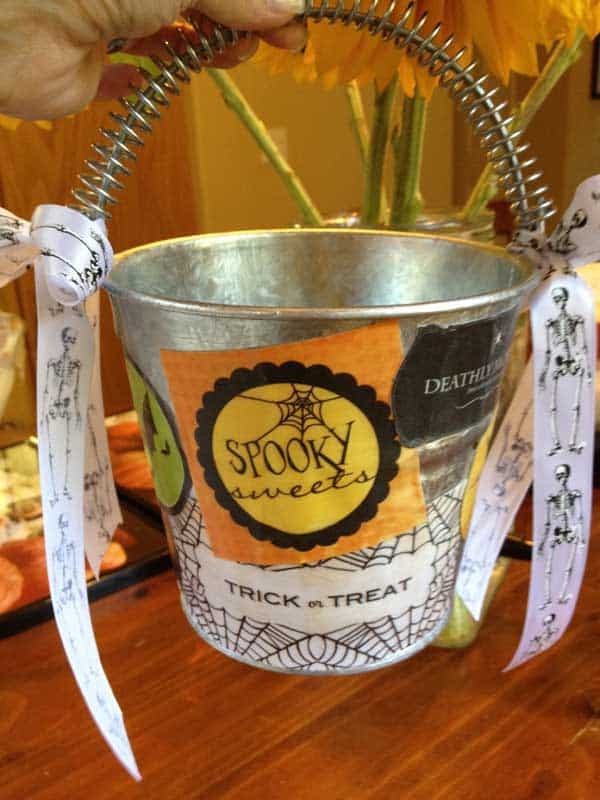 Use your spray mount to attach your printables and images to the bucket. You can cover the whole thing or just place them in certain spots. Use Modgepodge to cover the printables and we suggest using two coats. Wait overnight for it to dry before using and make sure you do this over a canvas cover or newspaper. 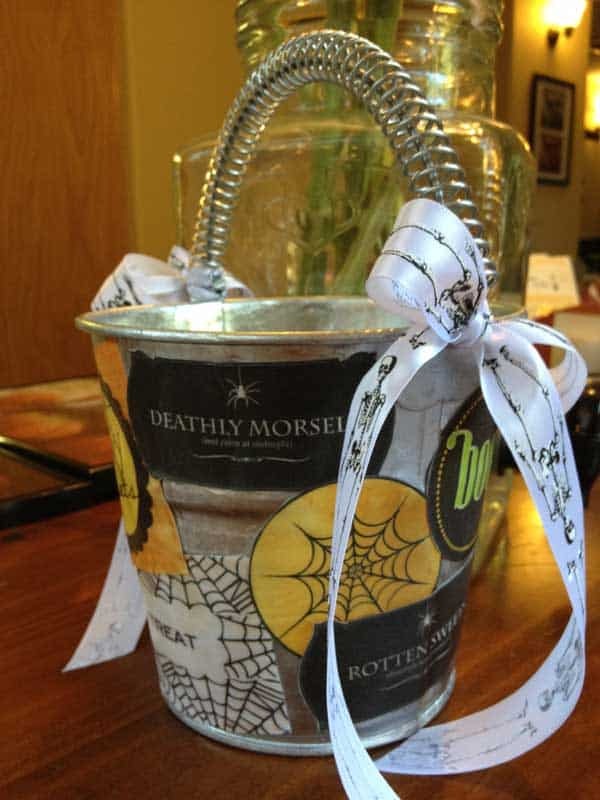 We chose to finalize our bucket with a bit of Halloween ribbon. You could add beads or skulls or anything else so be creative.